Thank you gifts don't stop with the grown ups. 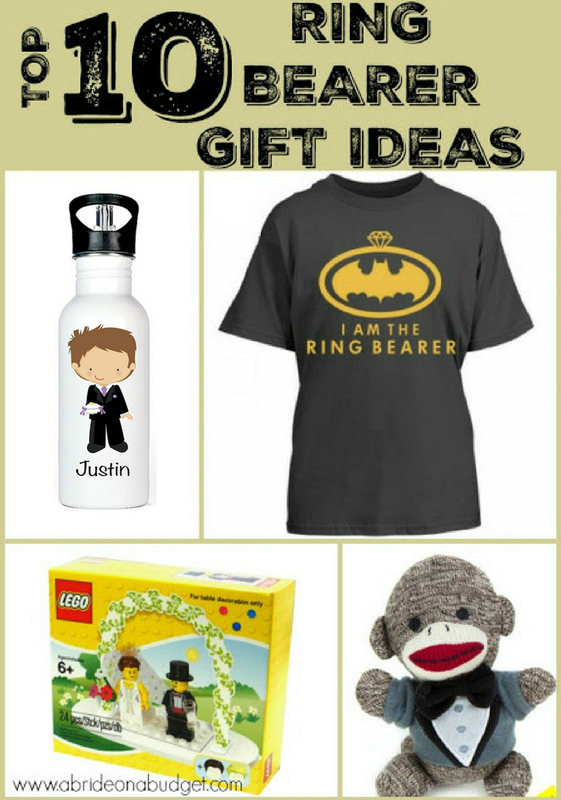 You should also pick up gifts for your ring bearer and flower girl. We're forgetting about the little girls right now, though, because this post is focusing on boys ring bearer gifts. If you're looking for a gift for the little man in your wedding party, we're here to help. Our top 10 ring bearer gifts are below. I am a big fan of getting kids toys that don't light or beep. Anything that's not electronic is a big yes in my book. Especially if it encourages play. I say that, I guess, because we only have nephews, no kids of our own yet. So I'm always trying to get them gifts that they can play with and that we can play together. Nothing where we're both staring at a screen. 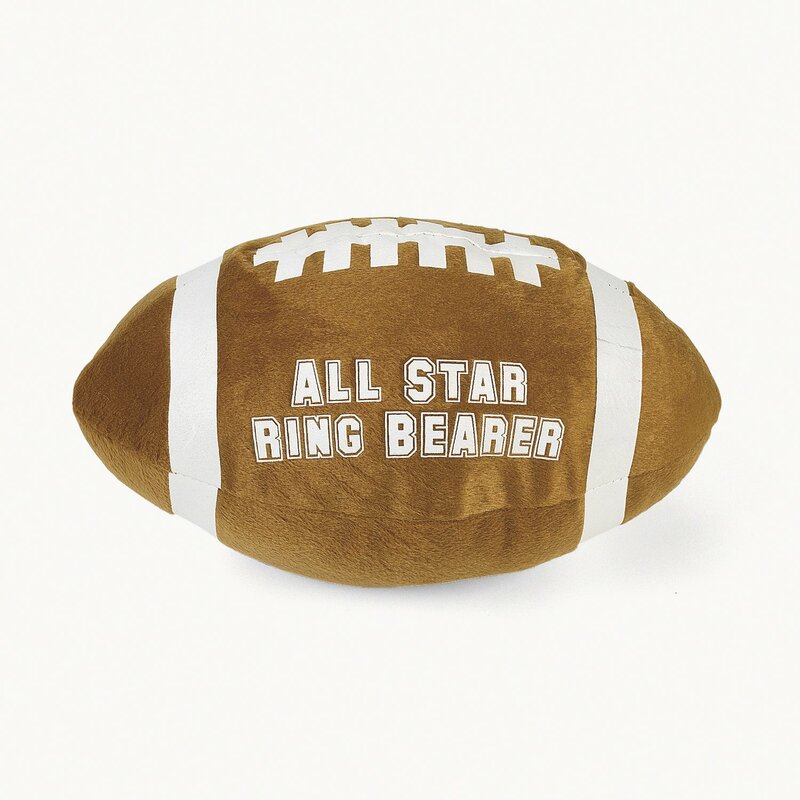 This All Star Ring Bearer Plush Football is perfect for that. It's something to commemorate the day. It's also something they can play with at the rehearsal dinner (where you usually give the gifts). It'll keep them entertained that day, and then will give them something to play with long after the wedding. Is your ring bearer more into baseball than football? No worries. We still got you. 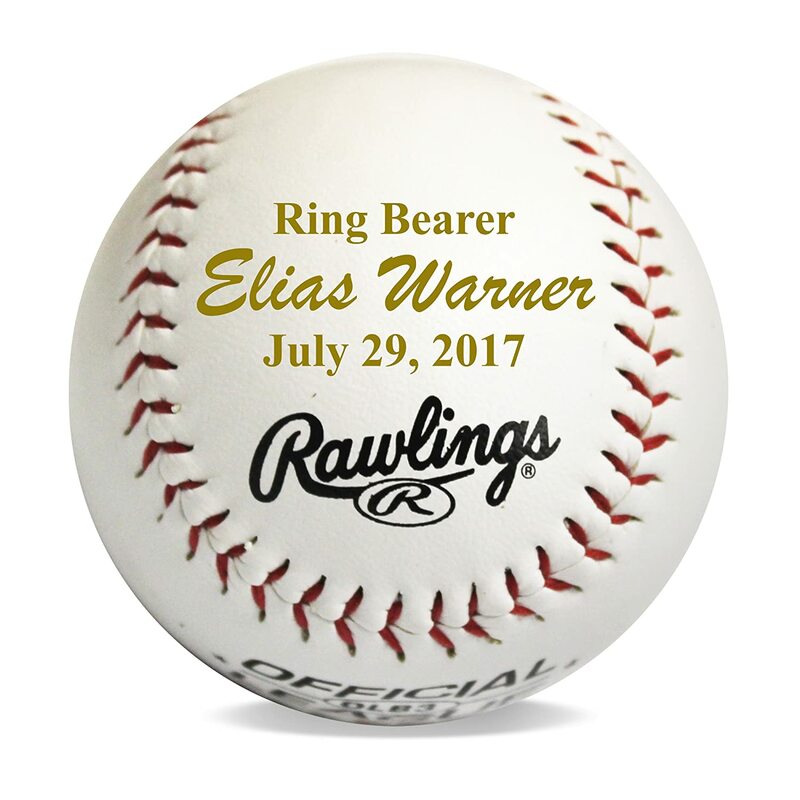 Pick up this Personalized Ring Bearer Baseball instead. Yes, it's personalized, but yes, it also should be played with. Toys for kids shouldn't need to be kept perfect. This baseball, covered in dirt and memories from your reception, will be worth more than if it was kept perfectly white for years. 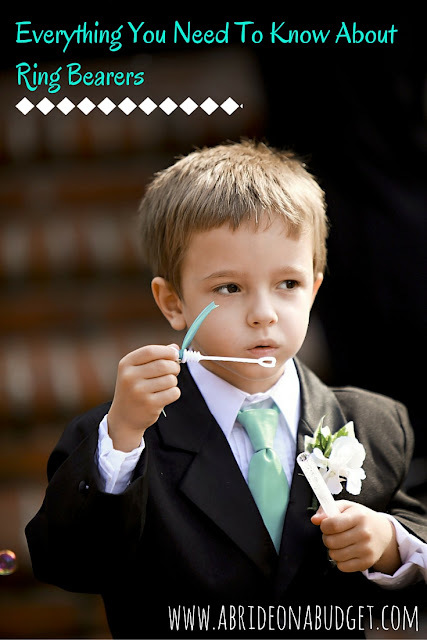 How much does your ring bearer know about being a ring bearer? 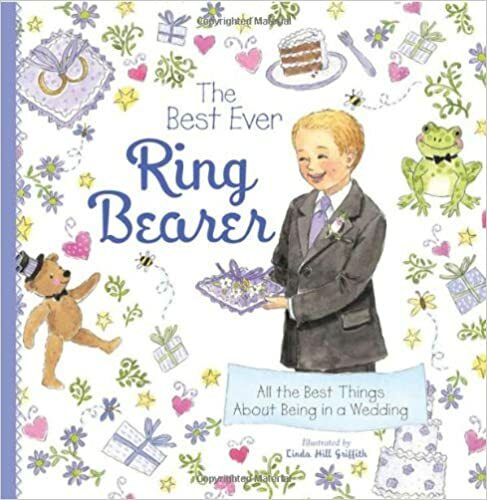 If you pick him up The Best Ever Ring Bearer Book, it will tell him everything he needs to know about being a ring bearer. And that'll be fun for him to learn (and a little easier on his parents who will have to explain his duties). This might be a gift you'll want to give him when you ask him to be your ring bearer instead of when he's already committed, but it's up to you. Boys like cars. It seems to be a big hit with every young boy. But you can always give die-cast toy cars. 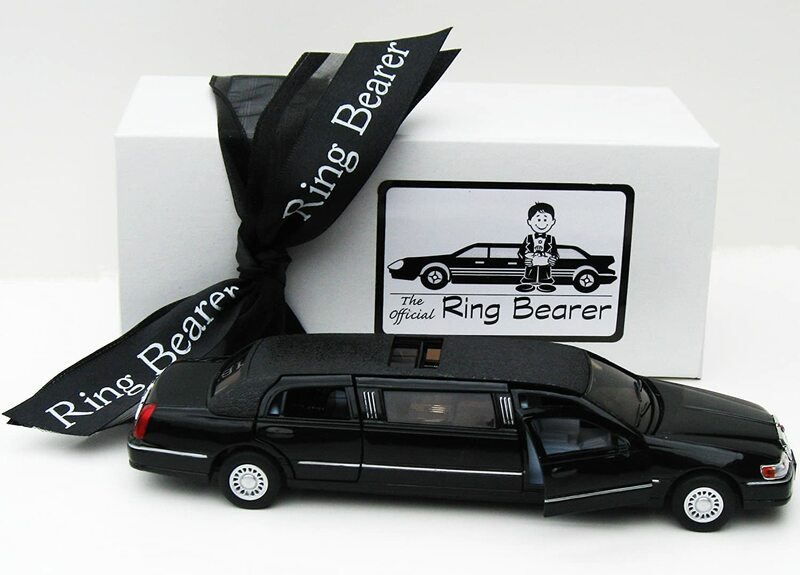 You can't always give a Ring Bearer Stretch Limo, now can you? This has pull back action too, which is super fun (and can be good if there's a pretend runaway bride inside!). If this will be your ring bearer's first time inside a limo, this is a really fun way to commemorate that. Sock monkeys are so cute. 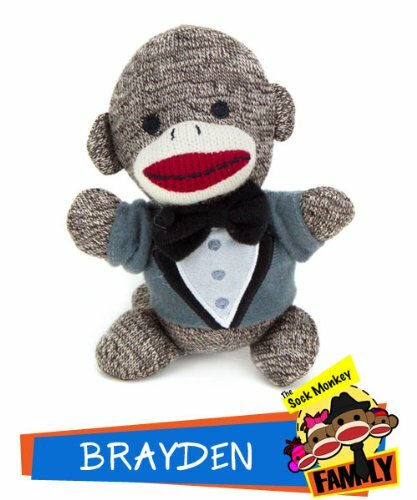 And this Ring Bearer Sock Monkey is from when this sock monkey was actually in a wedding. I mean, that's what the description told me. It's so cute and I can imagine your little ring bearer snuggling with it after the reception ... and for many nights after. I like wedding clothing. It's fun to wear during wedding week, and then you can use it as (to use Pete's term) knock around clothes after. 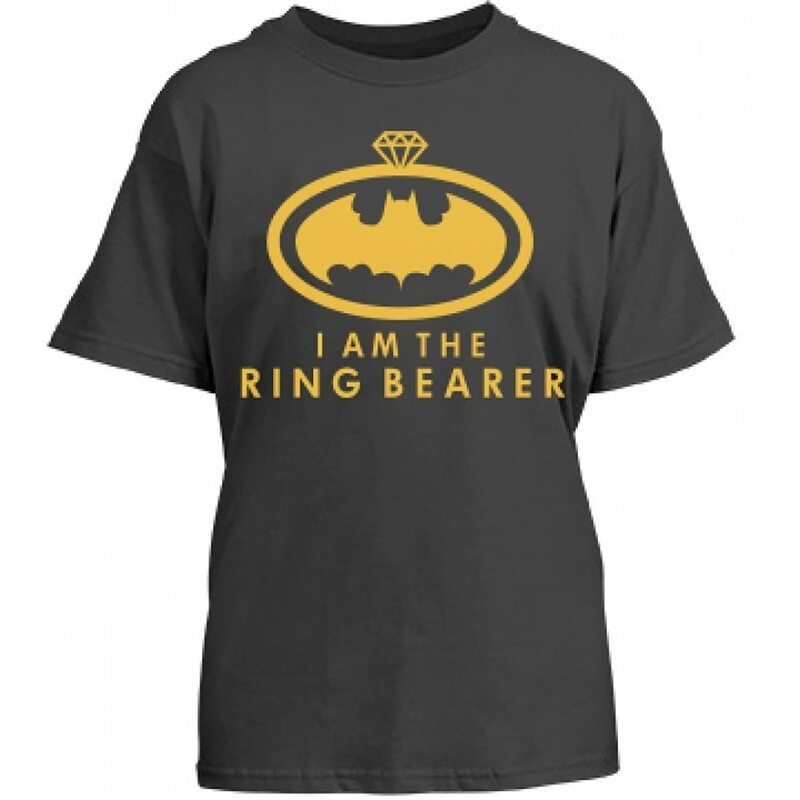 I've seen a lot of plain items, but this I Am The Ring Bearer T-Shirt is so awesome because it's a play on Batman. And, I'm not saying your ring bearer is Batman, but I've never seen him and Batman in the same room. The shirt comes in sizes youth medium, youth extra-large, small, and medium, so it should fit the majority of your ring bearers. 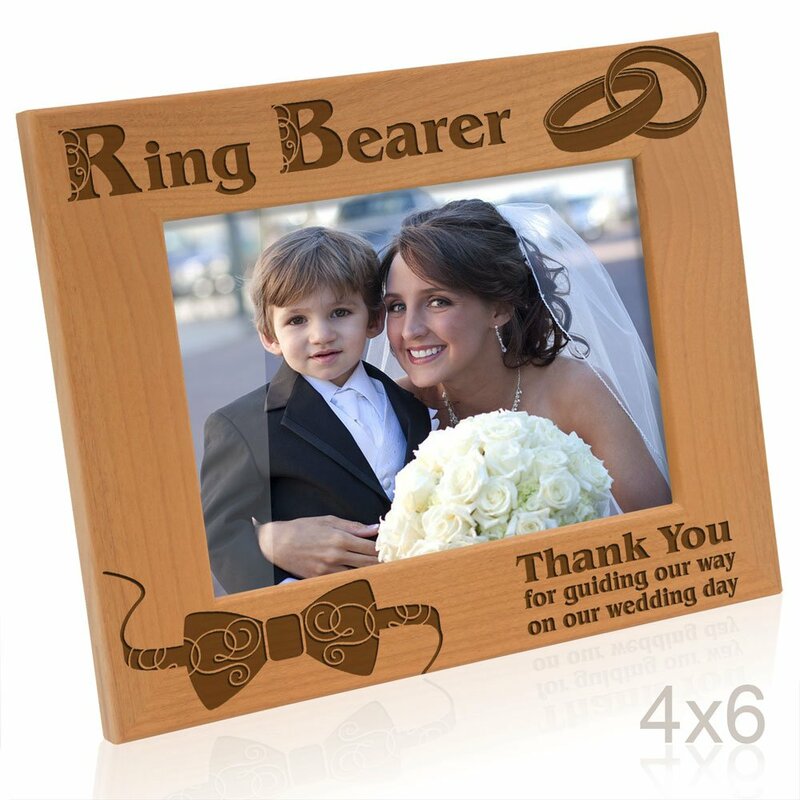 This gift is a little more for the parents than the ring bearer himself, but you can pick up a Ring Bearer Picture Frame. I actually made one at CafePress for our ring bearer so I could add his name to it. I really loved it ... and I think our ring bearer loved that we also gave him a toy with it. After your wedding, be sure to add a photo of your ring bearer with your thank you card. That way, his parents can add it to his frame. 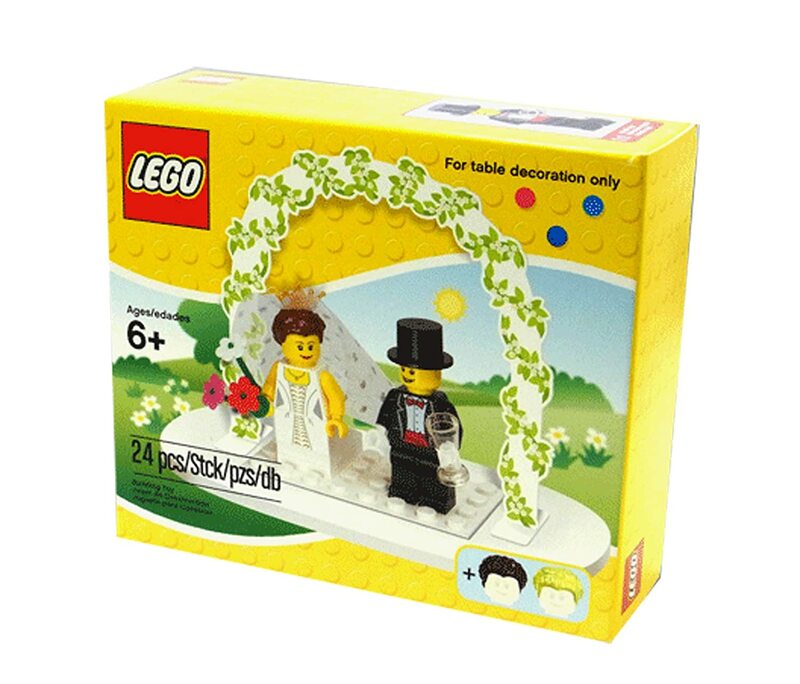 If your ring bearer loves LEGO toys, this LEGO Wedding Table Decoration Set is the way to go. It comes with a bride and groom too, plus great accessories, which is fun. I mean, just look at that top hat and drink the groom has. And the bride's flower and veil are adorable too. You can set up a kids table at your wedding, use this to mark it, and let the ring bearer take it home at the end of the night. Weddings can be long for kids, especially the ceremony. They might get antsy, especially if you have a summer wedding and they get hot and thirsty. My friend Michelle -- whose son was a ring bearer -- said a cup with a straw is a great way to go. The straw is important so they don't spill and get messy before the reception, so this Ring Bearer Water Bottle is perfect. 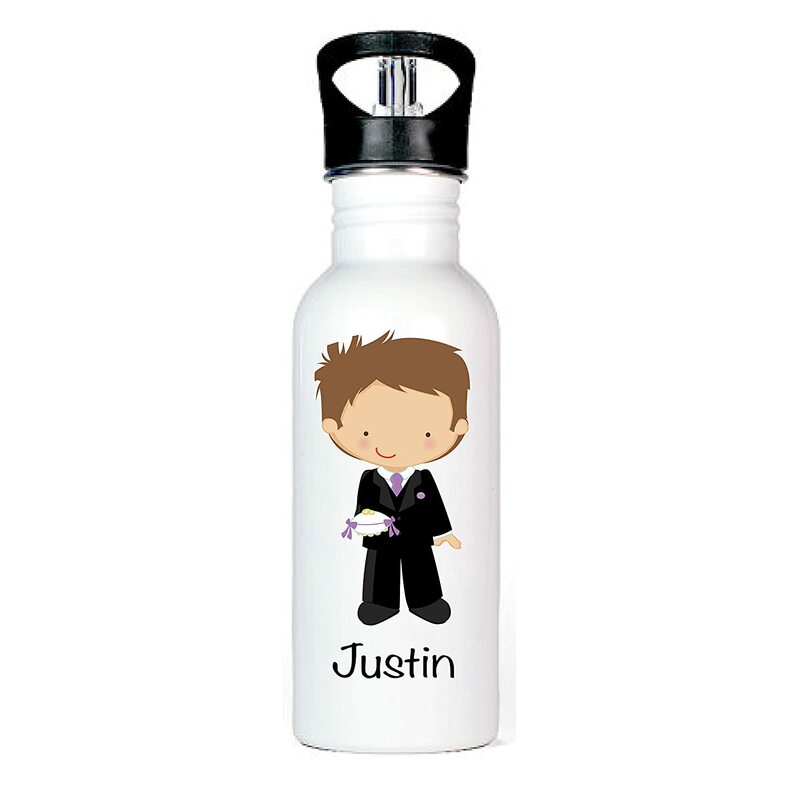 It's a water bottle, which you can personalize with your ring bearer's name. It also has a straw, so you don't have to worry about him spilling all over himself. I still have my piggy bank from when I was a little kid. It also still has all my money from when I was a little kid in it. It's so special to me. 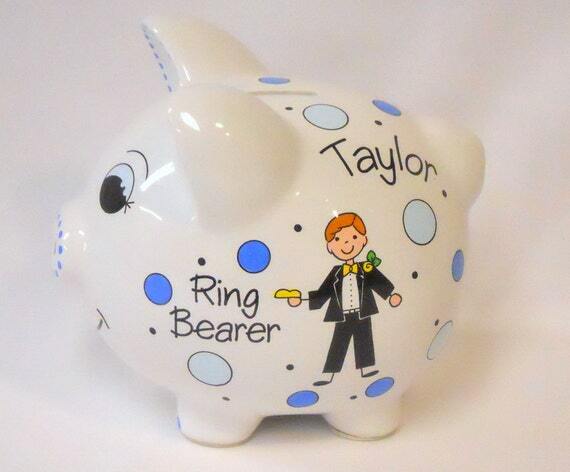 And a cute Ring Bearer Piggy Bank would be really special for your ring bearer. You can get it personalized with your ring bearer's name on one side and your wedding date on the other. BRIDAL BABBLE: Which of these ring bearer gift ideas is your favorite? Check out our Everything You Need To Know About Ring Bearers post.